Since you are on Windows, no installation is needed, just unpack the downloaded file and run the FreeCAD.exe. Hi everyone. I tried to run that example but i've a error message. someone know what happend?. 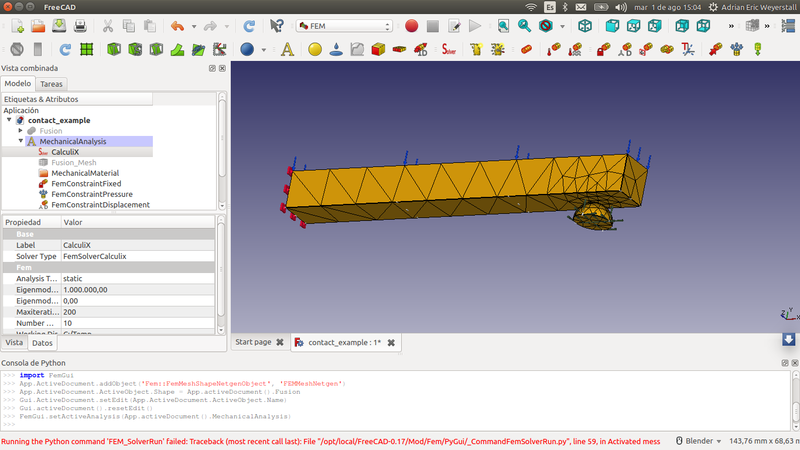 I have FreeCAD 0.17 Rev 11714 (Git) - Ubuntu 16.04. I can run others fems methods Ok, but I can not make it work with Contact method. Regards. should next better read WHOLE thread. Why is this different results means? I suppose the last one is the definitive, so I should omit the other ones?? how should I continue? Both materials are steel.